A nice trail over the attractive ridge of Drstva and Vito descending to mountain hut Tusila. It continues to Puzim pinnacle and joins a new trail through the forest to Ljuta river. 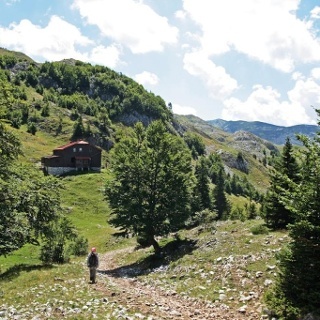 This Via Dinarica stage is a hiking trail that continues along the Rakitnica canyon, passes famous Cold Creek (Studeni potok) crosses over to Visocica Mountain and climbs up to Drstva Ridge. From Drstva, it is a nice ridge walk to the summit of Vito, from where it descends over scree slopes down to Tusila where a mountain lodge and other guesthouses are located. Close by is a rock wall with a bolted climbing area. The tour continues till the end of the local road and more towards Bjelimici for about one kilometer. Then it follows the Jelenjaca valley up to Puzimsko cemetery beneath the inspiring Puzim summit. It descends down to Ljuta valley through the forest of mainly beech trees and joins the forest road which brings you to Ljuta village. Take two days for this stage and visit Umoljani village to hear the legend about the dragon. When you leave the forest on the descent to Ljuta valley and join the road, you should remain on that road as the area around is suspected of landmines for a couple hundred meters. Standard hiking equipment. Sun hats and sunscreens are needed especially on the ridge walk. 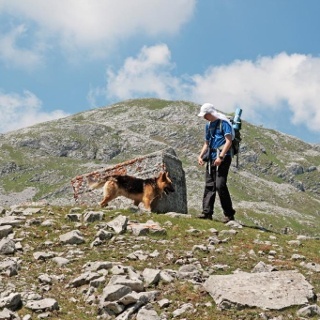 ...auf dem Balkan unterwegs - from Outdoor Active Stories. Umoljani is mentioned in the middle of the article. From Lukomir continue along the canyon benath the Obalj massif. After crossing Cold Creek (Studeni potok), turn right towards the canyon again and continue on the trail which brings you on the other side of the hill to rich spring and watermills. Descend down and turn right again toward the asphalt road going to Umoljani (it is also recommended to visit Umoljani village which is 20 minutes from there, but you turn left). The trail crosses serpentines and descends down to bridge over Rakitnica, follows a road for about a kilometer, and turns towards village of Bobovica. In Bobovica you continue to straight towards Drstva (left direction). From Drstva follow the ridge to Vito, and turn down left to the scree slopes a couple hundred meters after Vito summit. Follow the trail all the way down to Tusila back to the asphalt road. Turn right (or left if you take a break or stay over night in Vrela lodge) on the road and follow it to the end of the asphalt at which point you should turn right towards Bjelimici. After exiting the forest part leave the road, go into the pasture and turn left. Here is a lake during the spring time. The trail goes to the forest and follows the bottom of the valley up to the pass between Puzim, Visocica plateau and Red Cliff (Crveni Kuk). You’ll see the cemetery and the road (track) going on its north side along the fence. Follow that road which becomes a network of forest tracks, but remain on the main trunk till the end. Continue over the bank and glade which follows and you’ll join a new forest track after it. Make sure you don’t take any side tracks, which are clearly “secondary”. 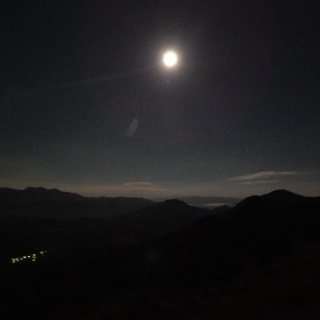 At one point, the view on Treskavica will open, and there you should take right turn downhill. This trail will end on proper forest road and descend passing by hamlet Vlahovici to river Ljuta. Turn right after crossing the bridge and take upper left road to go to hamlet Budovici in order to take a break/ overnight at household Vladavic located on the cool Palez creek (otherwise continue on the main road). In “centre”of Budovici turn left to come to Vladavic’s or right down to re-join the main road. This stage ends here in the village of Ljuta or its hamlet Budovici. Sarajevo Public Transport has lines to Sinanovici which crosses the trail at Rakitnica bridge, so first 6km should be skipped. Turn from road to Sinanovici to Lukavac and drive on macadam road through Dugo Polje. The section from Lukomir to Rakitnica bridge (junction to Umoljani) can be skipped, so the trail can start at Rakitnica bridge on the road to Sinanovici. no big parking area. it is possible to park next to the road. http://www.zone-2000.net/service/planinarske_karte/BJELASNICA.JPG - NOTE: only parts of this trail are included in this map. Yes. Agree with Eva, Oko Treskavica household (Vladavic family) are the best. Amazing place. Don't miss Vito peak. The knife edge way up was one of our favorite parts of the whole trail so far. Food in Trusila at the first restaurant was good. Lovin the trail. Visocica ridgewalk Drstva and Vito is magnificent, don't skip it.